Busy getting ready to film for Flyer Tiger 2 <飛虎之雷霆極戰>, Bosco Wong (黃宗澤) took some time out of his schedule to have dinner with co-star, Michael Miu (苗僑偉) and his wife Jamie Chik (戚美珍), as well as Lawrence Ng (吳啟華). Although frequently working in Mainland Chin in recent years, Bosco returns to Hong Kong to film a variety of series each year, with his latest being the second season of popular web drama, Flyer Tiger. 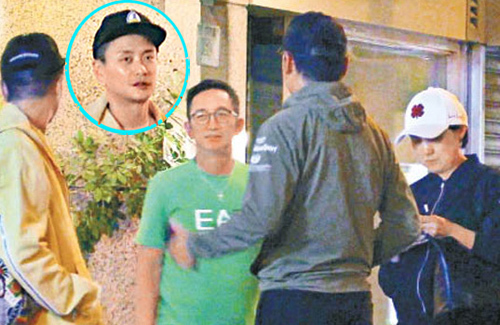 While Bosco’s filming schedule is very tight, it’s speculated that he’s looking to expand his business with the help of Lawrence Ng, whom has ventured into the food industry in Mainland China. Inviting Michael, Jamie, Lawrence, and a few other male friends out for a causal night dinner, the party stayed 11 p.m. before leaving. Photographed outside the restaurant, Bosco was seen chatting energetically with Michael and Lawrence. I will definitely watch Flying Tigers 2 because there is Bosco & Michael Miu…but Forensic Heroes cast looks more like ICAC. it’s strange not to have a main cast. Never really seen any of bosco’s work in Mainland China, but I’ve seen many of his HK shows. I guess tvb about to close down seeing how many of their A listers that actually has talent are leaving to Mainland China.